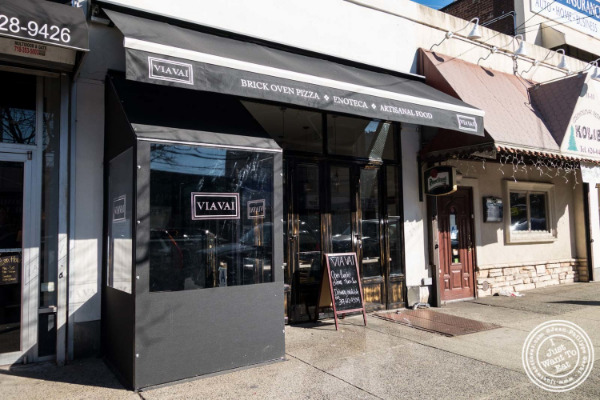 I was recently invited to Via Vai, an Italian restaurant that opened in June 2014, conveniently located few steps from the Ditmars train station in Astoria. This place use to be a gentlemen's club, not that I was a customer, but it came up in the conversation we enjoyed with owners Cynthia and Antonio Morichini, who is also the Executive Chef, as we were talking about the long path it takes to open a restaurant. Born in Italy, Chef Antonio Morichini has an impressive resume, having worked in few Michelin Star restaurants in Rome and Chiavari. Talking to him, I could definitely see the love and passion for what he is doing, passion that definitely translated in the food we tried. This place has a refined, but still rustic feel, thanks to the decor, especially the tables made with hundred year old wood tops and refurbished bottoms. In the back of the room, next to the bar, is the pizza oven. But not your regular one: it is a gas fired Italian-made brick pizza oven with a rotating cooking surface inside; I admit that it is the first time I have seen an oven of this sort. So, of course, we had to try the pizza. Chef Morichini is not saying that he makes the best pizza in town, but is proposing his own version of it, the dough being a roman-style thin crust, proofed for 48 hours. We followed his advice and went for the pizza Fichi that is made with fig marmalade, gorgonzola, prosciutto, arugula and truffle oil. I love when savory and sweet work well together and this was definitely a delicious pizza: the fig marmalade counterbalanced well the nutty and sharp taste of the gorgonzola, as well as the saltiness of the prosciutto. I also truly appreciated that there was only just few drops of truffle oil, enough to give a nice smell and a very slight flavor to the pizza. The same measure was used in their new dish: pumpkin flan. It has been a while I did not have a savory flan and this one was fantastic! Very elegant, it was prepared with a breaded egg yolk that was deliciously runny, adding even more creaminess, and paired with a cheese fondue and a balsamic vinegar reduction. I inhaled this flan that was fantastic: soft, airy, light and tasty, it was perfectly balanced. The last dish we tried was a Roman dish: bucatini all'Amatriciana, a very comforting specialty, that I would have probably mistook for a bolognese...It was made with pork cheeks instead of pork belly, the former being less fatty, tomato sauce, onion, black pepper and pecorino cheese. I literally devoured that dish and did not think that the sauce was only cooked for 12 minutes, the time it took to get the bucatini perfectly al dente. I highly recommend that dish. Of course, we could not refuse to try their desserts. We got a tiramisu and a panna cotta. Both desserts were very good. The panna cotta was well set (I moved the plate back and forth and it moved like jello), but I admit that my favorite was the tiramisu. I am always looking forward for a good tiramisu in an Italian restaurant and this one was on point: very creamy and not too sweet (Chef Morichini explained that he is using the cookies for babies rather than lady fingers, as they are less sweet). Everything was again well balanced. I really liked Via Vai: the food was delicious and the atmosphere welcoming. This is the type of neighborhood gem I would like to have close to my apartment, so we can go often and get some great Italian food at reasonable prices. Grazie Chef!